As the sun begins making regular appearances, Fuller Center teams across the nation are lacing up their work boots. 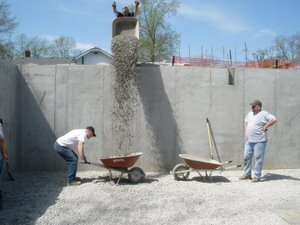 The Fuller Center of Greater Kansas City leaped at the opportunity to begin construction on their first new home, pouring the foundation mid-March. Since then they’ve had weekly work days and teams from local colleges and schools on spring break–in addition to regular local volunteers. The homeowner, Lorie Perdieu has been out to the site of her new home as much as possible. "And I’ve got the sun burns to prove it," she said. Perdieu was born with arthrogryposis, a congenital disorder that affects nearly every joint in her body. "I tell people that my mind works fine, my mouth works overtime, but my body doesn’t cooperate," Perdieu said. She works as an Advocacy Specialist for the state–acting as a liaison between community and state organizations that provide disability services. Larry Washington, who serves on the Greater Kansas City Fuller Center board, met Perdieu at an awards ceremony last year where she received the Advocate of the Year award from the Jackson County Board of Services. Washington thought Perdieu was the perfect candidate for the Kansas City home. The home will be built using universal design through a Fuller Center partnership with Northland Neighborhoods, Inc., where Washington serves as the director of housing services. "Having a brand new home is a wild new concept for me," Perdieu said. "I’ve never had a porch. I’ve never had a garage. I’ve never had a basement that I could get into." Now she will. "Those are some of the things that I’m just really stoked about," she said. But it’s also the small things. Her current home has a problem with wasps. Just a few days ago four or five wasps were flying around and all she could do was watch and hope they didn’t come too close. "The brand new home won’t have that problem," she said. Construction supervisor Charley Lamb said once the foundation was poured things kept moving. "Churches come out each Saturday," he said. "As long as it doesn’t rain." The sun has also been attracting volunteers for other covenant partners. Spring break college groups started flying south as early as February to volunteer in this rural Georgia town. Americus-Sumter County FCH is also building its first home–a handicap-accessible duplex for two homeowners. Read about the Americus homeowners here. An extension of the Greater Atlanta FCH, Project McDonough, started a renovation in January. 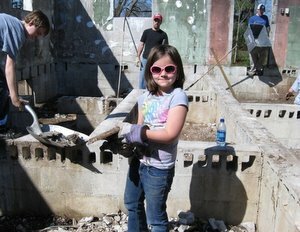 As things heat up, the project is attracting students, churches and local volunteers to work on a home for the DeLee family. Read more about the family and project here! Volunteer season is indeed upon us. Search for a project near you! Or get your church involved on local repairs through our Faith Builders program.